The SHIELD TV is the best Android TV device around, even if its competition isn't up to much. With NVIDIA's Tegra X1 architecture and an available 500GB hard drive on the Pro model, one might wonder why something like the fan-favorite Plex software wasn't available before. (Plex was previously installed on the SHIELD, but only as a client for streaming media from another server.) Well soon enough it will be: NVIDIA and Plex announced that the next update to the SHIELD firmware will include a built-in Plex media server. That's kind of a big deal, at least for those users who already have Plex and want to host it on something other than a full-sized, always-on desktop. 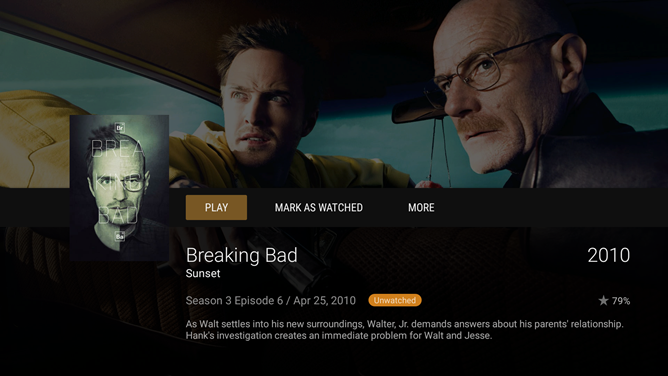 The Plex server on the SHIELD will have all the capabilities the current version has, including streaming to remote devices across the Internet, all wrapped up in an Android TV interface. Granted, the 16GB of storage on the standard SHIELD TV is a paltry amount of space to host movies, music, and videos, and 500GB is only better in comparison. To get the most out of the new hosting capabilities, users will want to add on a nice spacious hard drive, either via the usual USB external storage mode or with the shiny new adoptable storage in Android 6.0. The latter is going to be particularly attractive thanks to the second big additional feature in the 3.2 upgrade: browsing the SHIELD's file storage from a local PC. NVIDIA didn't go into too much detail, but it appears that the process will be similar to adding a network drive in Windows. That will make it much easier to get media to and from the SHIELD in the first place. The remote file access will work with the SHIELD's internal storage and any volume added to adoptable storage, but external storage or the MicroSD card won't be available over the network. 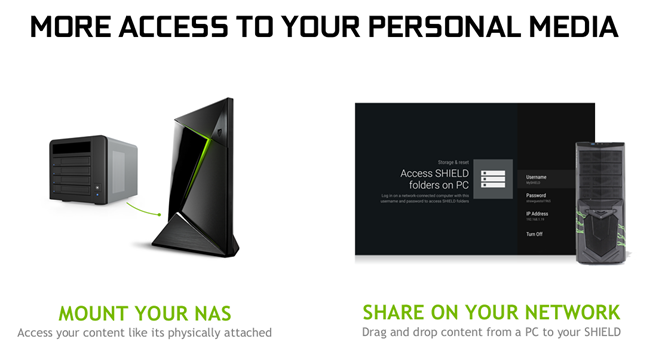 The SHIELD will also be able to mount any drives on your local network-attached storage (NAS). *Note that the Netflix search support is only voice search, not the universal Android TV search that the app desperately needs. NVIDIA hasn't said exactly when the next update will drop, but given how excited both they and Plex are for the new features, I'd be surprised if it was more than a week or two before it landed. That gives you enough time to find the biggest, cheapest hard drive you can and fill it up with totally legal and legitimate 1080p rips of Game of Thrones.